Manchester United are readying a £14.7m bid for Real Madrid centre-back Pepe according to the Metro. Louis van Gaal is seemingly keen to strengthen his defensive options and may feel that experienced Portuguese international Pepe is a solid option to pursue in January. The 32-year-old has started just three of Real Madrid’s eight La Liga fixtures thus far this season with Rafa Benitez more often turning to Sergio Ramos and Raphael Varane as his first-choice central defensive pairing. 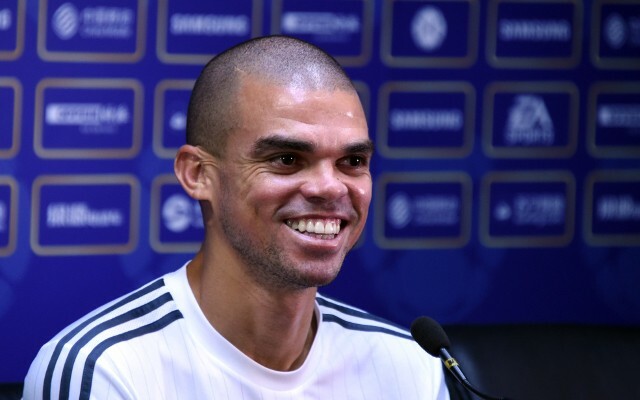 Pepe is into his ninth season in the Spanish capital and has made almost 300 appearances for Real Madrid but could perhaps be ready to leave for pastures new if by January his standing under Benitez hasn’t improved. Real Madrid sit top of La Liga having conceded just two goals thus far and as such Pepe may struggle to force his way back into Benitez’s plans. One obstacle that could stand in the way of Pepe’s move to Man United may be the frayed relationship between the two clubs following the David De Gea saga that ended on transfer deadline-day when Real Madrid failed to secure the services of the Old Trafford keeper.